Several public agencies are building large-scale public improvements in Southeast Portland that will require the public to plan ahead to avoid traffic delays on major thoroughfares. 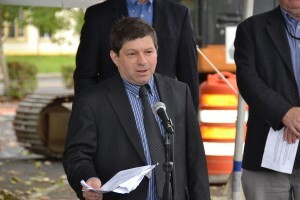 TriMet, Bureau of Environmental Services and the Portland Bureau of Transportation are working together to expand public transit access and create cleaner air and water. But first, the agencies have coordinated their construction schedules to try to ensure that major road closures on north-south corridors don’t overlap. 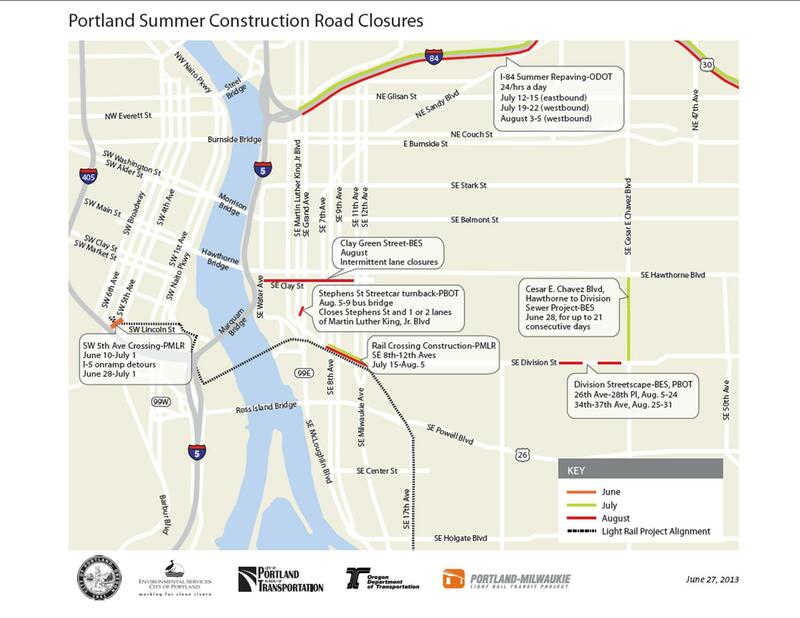 Some of the largest transportation corridors in Southeast Portland will be closed around the clock for weeks at a time. • Southeast Cesar Chavez will close first, for a sewer replacement project. • Then, construction related to the Portland-Milwaukie Light Rail Transit Project will close Southeast 8th through 12th avenues. • Subsequently, Southeast Division Street will be closed for three weeks. At a news conference held this morning Portland City Commissioner Steve Novick, TriMet General Manager Neil McFarlane, Environmental Services Director Dean Marriott, Oregon Department of Transportation Public Information Officer Don Hamilton and Portland Police Traffic Division Lt. Chris Davis outlined public impacts associated with these needed improvements and safety precautions motorists should take. 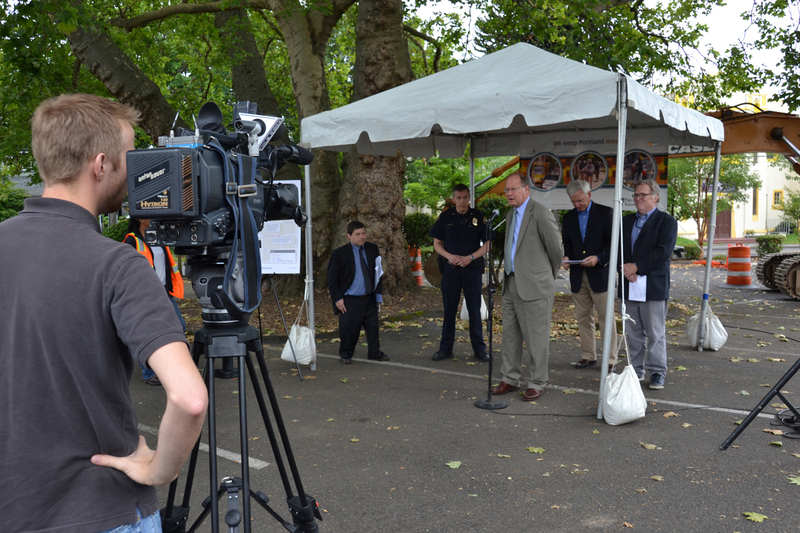 They also thanked the public for their understanding and patience while this summer work is completed. The Portland Police Bureau plans to provide targeted enforcement of traffic laws in the area of the construction projects to ensure motorists follow detour and construction signs and to prevent speeding on residential streets. All schedules are subject to change and dependant on weather and other factors. See project websites for up-to-date schedules. July 1. The project will expand the light rail system to 60-miles and improve public transit service between Portland, Milwaukie and North Clackamas County. Repaving of Interstate 84 will close the highway and related on-ramps for several weekends, 24 hours a day. Pedestrian improvements, street paving, sewer construction and stormwater management improvements will restrict traffic lanes on SE Division Street between SE 11th Avenue and SE Cesar Chavez Boulevard. The project will improve safety and access for pedestrians, bicyclists, people with disabilities and local businesses; make the sewer system more reliable; and add green infrastructure to make sewers work more efficiently and improve watershed health. Sewer construction will close SE Cesar Chavez Boulevard to through traffic between SE Hawthorne Boulevard and SE Division Street 24 hours a day for up to 21 consecutive days, and will completely close the intersection of Cesar Chavez Boulevard and SE Harrison Street. Detour signs will direct traffic to SE 30th and SE 50th avenues. The SE Lincoln Street neighborhood greenway will remain open across Cesar Chavez during construction. The project will replace 120-year-old sewers to improve sewer system reliability and protect public health. Light rail construction will close SE 8th, 11th and 12th avenues to through traffic along the light rail project near SE Division Street. The project will also create safer crossings, improve bike and pedestrian access and make improvements necessary for the City of Portland to acquire approval of a Quiet Zone, so train horns will only sound if there is an immediate safety issue. Green street construction and pedestrian and traffic improvements will cause temporary lane restrictions on SE Clay Street between SE 12th and SE Water avenues. The project will create safer connections to the Willamette River and an urban greenway through the Central Eastside Industrial District, improve sewer service and enhance watershed health. Sewer construction will close SE Division Street between SE 26th Avenue and SE 28th Place 24 hours a day for 19 consecutive days. Eastbound traffic will detour to SE Clinton Street, westbound traffic to SE Grant Street. The Portland Noise Office granted a variance to allow construction outside of normal work hours. The project will replace 80- to 100-year-old sewers to improve sewer system reliability and protect public health. Portland Streetcar construction will close SE Stephens Street at SE Martin Luther King (MLK), Jr. Boulevard 24 hours a day with local business access only. The work will also close one to two lanes of traffic on SE MLK for all hours except for 3:00 p.m. to 7:00 p.m. The project will add streetcar tracks to allow the streetcar to turn around from southbound to northbound. This will allow Portland Streetcar service to continue even during construction of a connectionto the Portland-Milwaukie Light Rail Transit Project’s new bridge later this year and during future events. Sewer construction will close SE Division Street between SE 34th and SE 37th avenues 24 hours a day for seven consecutive days. Eastbound traffic will detour to SE Clinton Street, westbound traffic to SE Grant Street. The Portland Noise Office granted a variance to allow construction outside of normal work hours. The project will replace 80- to 100-year-old sewers to improve sewer system reliability and protect public health.